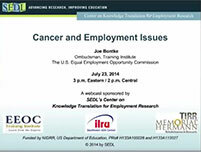 The research activity associated with this webinar has concluded. A webcast will be presented on August 30, 2016 describing the results of this activity. Today, survivorship after a diagnosis of cancer is higher than ever. While that fact can be celebrated there is another side to that news: many survivors must continue to work to support their families. Why are we suggesting you participate in this webinar? Regardless of the benefits to employees, some employers worry about the cost and productivity of keeping employees experiencing cancer on their payroll. Studies indicate that cancer survivors, compared to other disability groups, tend to charge discrimination more often on issues associated with job-loss, terms and conditions of employment, wages, and demotion. They are eligible to make these charges as part of their protection under the ADA.